Hydro-Gro Select is lightweight, expanded shale aggregates designed for use as growing media in hydroponic and aquaponic systems. The 1/2” to 3/4” porous particles are structurally strong ensuring they will not degrade or breakdown. Hydro-Gro Select is highly porous ensuring excellent air exchange and moisture retention. The balanced combination of aggregate sizes provides large pore spaces between aggregate allowing excellent drainage and maintaining optimum oxygen levels. Hydro-Gro Select retains a large amount of moisture which can reduce the amount of flooding cycles. The particles are quick to wet and the moisture is evenly distributed. Excess water is rapidly drained away. Additionally, the large amount of surface area facilitate beneficial bacteria and fine root development. Hydro-Gro Select efficiently releases the absorbed nutrients and moisture as required by the plant roots. 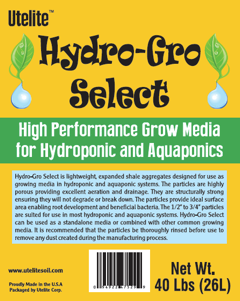 Hydro-Gro Select is suited for use in multiple hydroponic and aquaponic systems. It can be used alone or combined with other growing substrates. Hydro-Gro Select is available in 40 lb. (26L) bags, 1 ton Super Sacks and loose.